(PhysOrg.com) -- A new bird-friendly glass has been developed that could prevent the deaths and serious injuries of countless birds that fly at high speed into glass windows. Birds do not see transparent glass, but are misled by the landscape reflected in the window or seen through it into thinking their way is clear of obstacles. Stickers attached to the glass have been shown to have almost no effect, and have even been taken off the market in Switzerland. Stickers are only really effective if they cover a significant portion of the glass. A new product, called Ornilux Mikado glass, addresses the issue. 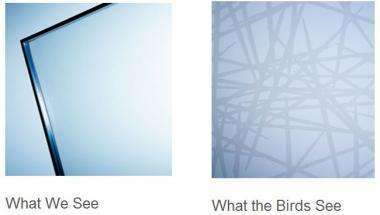 The insulating glass was developed by German company Arnold Glas and is glass sheeting with a special ultraviolet (UV) reflective coating that is almost invisible to the human eye, but looks like a spider's web to birds. Birds are able to see a broader spectrum of wavelengths than humans, and can easily see the UV lines on the coating. The glass is claimed to reduce bird collisions by 76%. The spider web design is just barely visible to the human eye when the glass is viewed against a backlight, but ordinarily does not spoil the view, and the coating makes no reduction in the glass's transparency. The product was named after the game Mikado or pick-up sticks, since the pattern bears a resemblance to the game. The glass was developed by Arnold Glas in conjuction with the Max Planck Institute for Ornithology, and was tested on 19 species of garden birds in a flight tunnel at the Radolfzell Bird Sanctuary. Wild birds were captured and released into the flight tunnel, where they could choose to fly towards a sheet of plain glass or a sheet of Ornilux glass. Of the 108 test flights, 82 of the birds flew towards the plain glass and avoided the Ornilux. Ornilux Mikado is the latest version of bird-friendly insulating glass. The first installation consisted of 152 sheets of Ornilux Mikado's predecessor, the Ornilux SB 1, for the 250 square meter glass facade of an enclosed swimming pool in Plauen, Germany, during its modernization in early 2006. Arnold Glas, based in Merkendorf, Germany, recently won an International design award, the Design Zentrum Nordrhein Westfalen, in Essen, Germany, for the bird-friendly glass. "claimed to reduce bird collisions by 76%"
"Of the 108 test flights, 82 of the birds flew towards the plain glass and avoided the Ornilux." 82 of 108 appears to be the 76% value being quoted, but it seems to me that if the new glass was no better than regular glass, 50% of the birds would already avoid it since they had two options, making the improvement less significant.